Get your plans set before the summer break! Summer break is here or near, vacation plans have been made, and there are still nearly three months left to prepare for the BMW BERLIN-MARATHON Inline Skating. On September 15, the city will be ready to serve as your stage for the summer athletic highlight. Take the challenge, you can do it! You still have enough time to get ready. The registration deadline is mid-August. If you get your bib number before the holidays, then you will be all set for a relaxed trip to the beach or the lake. And if you pack smart, you can squeeze your skates into your luggage. Your athletic summer awaits you! 1. Make your personal challenge a challenge for you and your friends! 4. Win big: Sheer driving pleasure for six months with BMW i3! 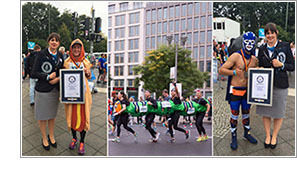 With the “Come on and join me” promotion, the BMW BERLIN-MARATHON becomes a joint challenge that is really worth it. 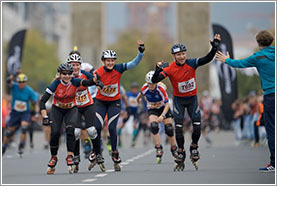 Race together at the BMW BERLIN-MARATHON Inline Skating and profit from the welcome bonus for marathon newbies. 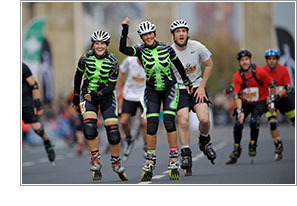 All inline skaters who have never participated in the BMW BERLIN-MARATHON Inline Skating can register at half price if they sign up together with someone who has already participated. Additional information is available on our website. You don't have to do it on your own! The Experts Marathon Guides will help you! If you would rather experience the challenge of the marathon in a group than on your own, the Experts Marathon Guides are perfect for you. You can get the drafting you want to help carry you easily to the finish, helping you reach your new personal best. The Expert Marathon Guides will accompany you along the course, give you tips to take advantage of drafting, and always keep an eye on the time to help you achieve your desired results. Additional information for the guiding service is available here (in German only). If you want to test your condition during summer, come be part of the fastest night in Berlin at the adidas Runners City Night Inline Skating on July 28, where the motto is “No Speed Limit on the Ku’damm.” Berlin’s most popular shopping boulevard offers the perfect stage for newbies, skaters with high ambitions, as well as kids on a sporty summer evening in the centre of the capital. 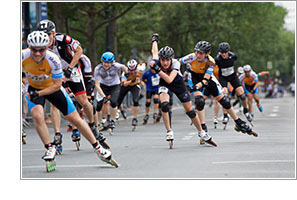 Cheered on by thousands of spectators, you can either make your wheels glow on the asphalt or have a relaxed skate without any competitive pressure. Sometimes you can learn more in a competition than you do in training, so just come and have fun. Additional information is available on our website. 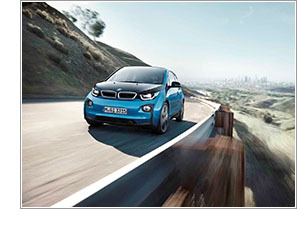 Win big: Sheer driving pleasure for yix months with BMW i3! Since 2011 BMW is important partner of running and is present at many marathons, for example the BMW BERLIN-MARATHON. Register now for the BMW running prize competition and win pleasure and excitement by driving BMW i3 six months for free. In addition, BMW regularly raffles starting slots for the BMW BERLIN-MARATHON at www.bmw-laufsport.de. Visit our homepage – it’s worth it! Click here to register now. Three months to go until the 45th BMW BERLIN-MARATHON – experienced athletes know that regeneration breaks during the preparation phase are just as important as the training sessions themselves. A beautifully chilled ERDINGER Alkoholfrei directly after training is definitely recommended. And athletes can look forward to the race in September. As a loyal supporter of endurance sports, the isotonic thirst-quencher ERDINGER Alkoholfrei will be at the line to greet finishers and reward them for their personal performance. 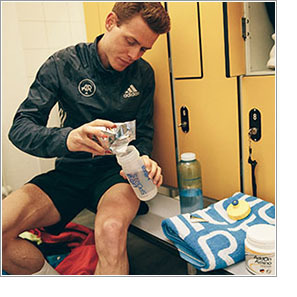 As the official sports nutrition partner of the BMW BERLIN-MARATHON, we will be supplying you with your energy. In order to give you the opportunity to test our products during training, we have put together an attractive Berlin test package that you can order directly from us. On Wednesday 27th June, we will be providing you with a live webinar by Dr Wolfgang Feil, the brain behind ultraSPORTS and consultant to many professional endurance athletes. 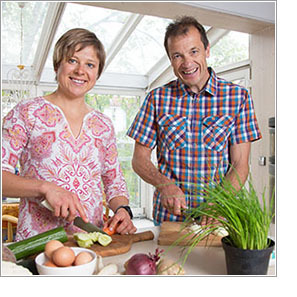 Here you will learn how the right nutrition can increase your training success. Tune in to the live webinar on the 27/06/18 shortly before 9 pm CEST (in English). Make your BMW BERLIN-MARATHON experience even more memorable by using your place to fundraise for a cause close to your heart. Visit the official Charity Listings to view a range of UK and international charities you can raise money for - your support will mean the world to them. Or, if you’re still not in the race, these charities still have places in the 2018 BMW BERLIN-MARATHON available for fundraisers! Sign up now!